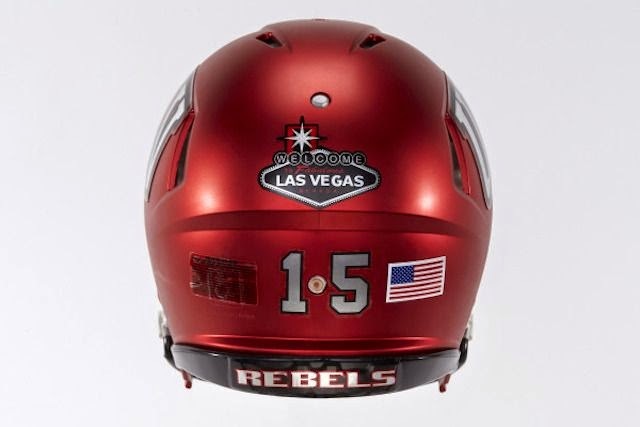 UNLV unveils Las Vegas-inspired uniforms for 2015 season. Image via Mountain West Connection. UNLV is finally embracing its "inner Vegas." The school released images of its new Nike-designed uniforms for the 2015 season on Thursday. Georgia Tech puts ball from 220-0 win over Cumberland University on display in athletic center. "Cumberland Ball." Photo via ajc.com. 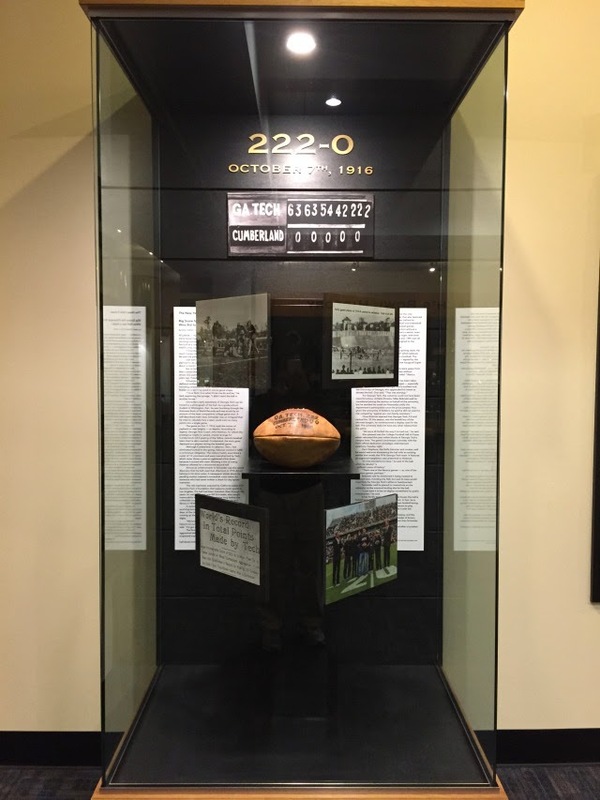 Georgia Tech has put the game ball from its 1916 220-0 victory over Cumberland University on display in its Arthur B. Edge Jr. Intercollegiate Athletic Center. The game has become both legendary and infamous for producing the most lopsided final score in college football history. Auburn DE Elijah Daniel suspended after arrest on multiple theft and burglary charges. Elijah Daniel, via The Opelika-Auburn News. Auburn defensive end Elijah Daniel has been suspended from participation with the school's football program following his arrest on seven charges involving accusations of theft and burglary on Wednesday. Cornerback Cyrus Jones becomes fourth Alabama player to be arrested since March. Cyrus Jones' mugshot. Via al.com. Yet another Alabama football player is in trouble with the police. 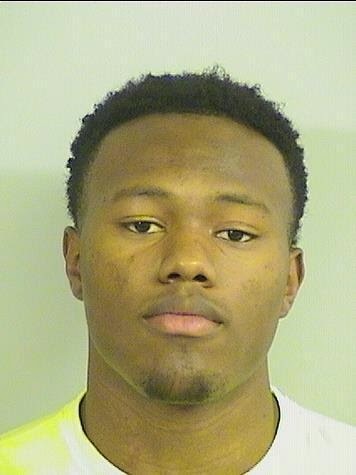 Cornerback Cyrus Jones is the fourth Crimson Tide player since March 28 to face criminal charges, and the second to face charges of domestic violence. 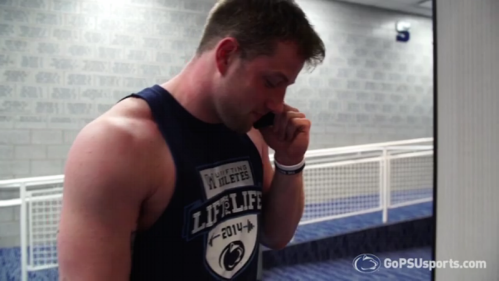 Video: Penn State linebacker Von Walker goes from walk-on to scholarship player. Von Walker. Via Dr. Saturday. There may be nothing cooler when it comes to college football-related videos as when the camera captures the moment when a walk-on is being put on scholarship. That's what happened to Penn State linebacker Von Walker, whose hard work was rewarded on Tuesday. 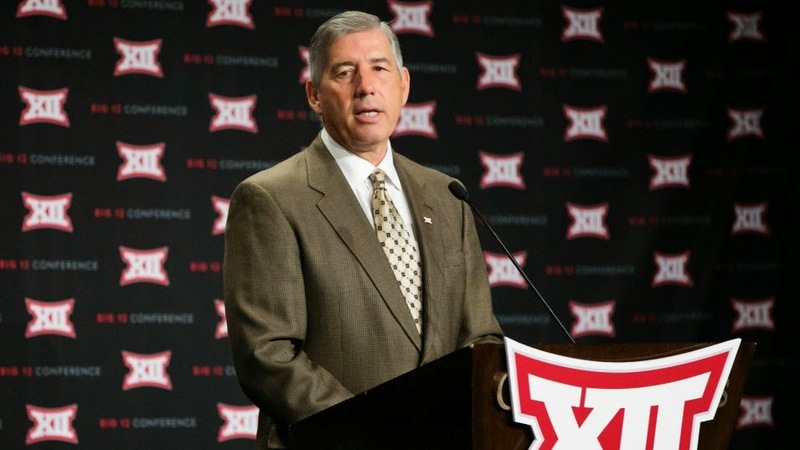 Big 12 to likely create tiebreaker to prevent 2014 "co-champions' fiasco from happening again. Bob Bowlsby. Photo via USA Today. From the "Closing the barn door after the horses have all run away" dept. comes word that the Big 12 is looking into implement a tiebreaker next season, which would in theory do away with any future possibilities of two teams being declared "co-champions." The Fallout: Connor Cook, Jim McElwain, Devin Lucien, and more. Dan Hancock comments on the recent Florida booster club Gator Gathering in Orlando, , featuring first year Gator coach Jim McElwain, being closed to the media. Lucien in the Sky With Diamonds. Oregon student athletes thank Marcus Mariota in new video. Oregon football reached new heights with former starting quarterback Marcus Mariota. As the reigning Heisman Trophy winner prepares for the 2015 NFL Draft, the school released a "thank you" video, which features many of the student athletes from several of its sports programs. 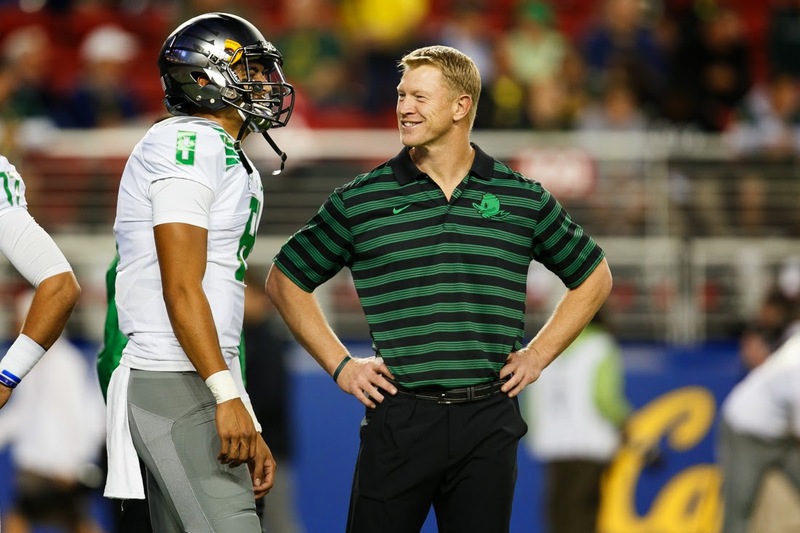 Oregon OC Scott Frost downplays concern for the Duck's post-Mariota future. Marcus Mariota with Scott Frost. Photo via The Daily Emerald. Oregon fans will be watching the 2015 NFL Draft closely to see which team picks the Ducks' former starting quarterback, Marcus Mariota. More than a few of them will probably do so with a touch of apprehension for the program's future without him. Four-star OT prospect Brodarious Hamm commits to Tennessee. Brodarious Hamm. 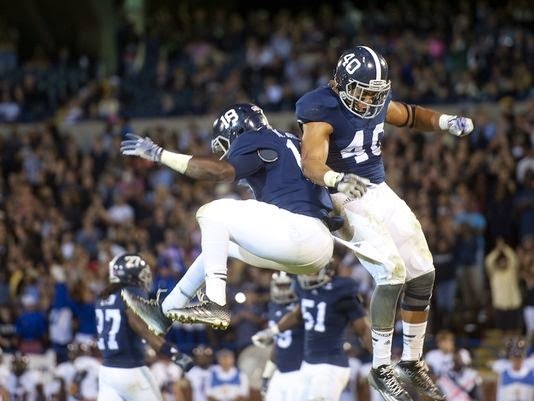 Photo via The Atlanta Journal-Constitution. Tennessee snagged a four-star recruit right from under Georgia over the weekend. 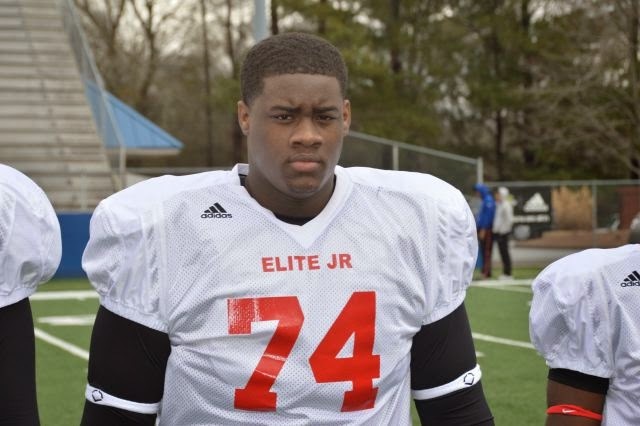 Griffin, Ga. 2016 offensive tackle prospect Brodarious Hamm (file that for Name of the Year 2016! 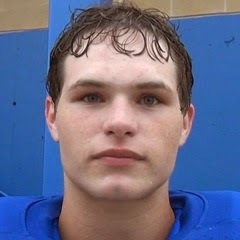 ), who had been previously leaning towards either Georgia or Auburn, verbally committed to the Vols over the weekend. 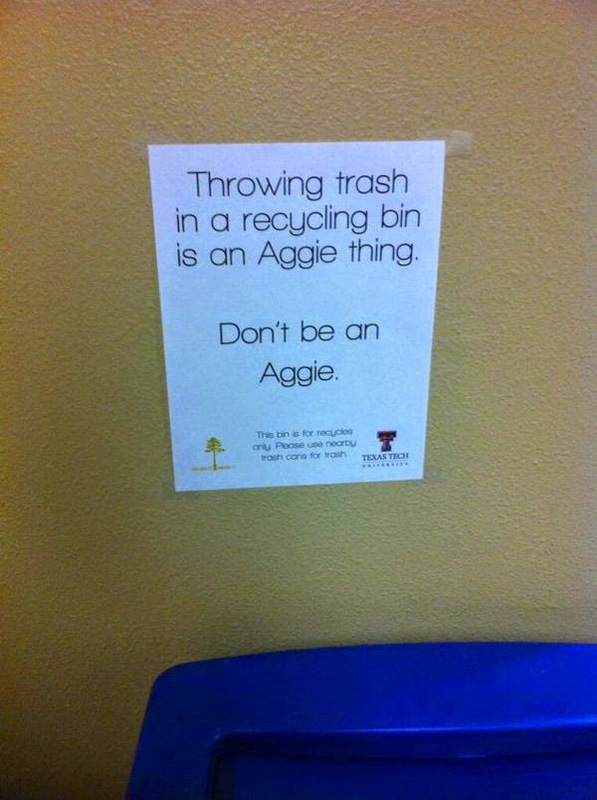 Flier at Texas Tech declares "Throwing trash in a recycling bin is an Aggie Thing." It's been almost three years since Texas A&M left the Big 12 Conference for the SEC. That doesn't mean the Big 12 is ready to move on from clean, old-fashioned hatred of the Aggies. Michigan State adds Ohio tight end prospect Noah Davis to its 2016 recruiting class. Noah Davis. Photo via Scout.com. It looks to be a big day for Michigan State. Not only did the school release an incredible six-minute hype video, but it gained a commitment for its 2016 recruiting class. Michigan State releases six-minute hype video. Got a few minutes - like maybe six? That's how long Michigan State's latest hype video is. Of course, when you've gone 24-3 over the past two seasons, and won the 2014 Rose Bowl and 2015 Cotton Bowl, you've got a lot of things to hype. The Fallout: Peyton Manning, Jim Harbaugh, Gary Pinkel, and more. Michigan State 2015 uniforms unveiled. Uncle Phil's Misguided Children are at it again. This time, Nike has revealed the 2015 uniforms for Michigan State. 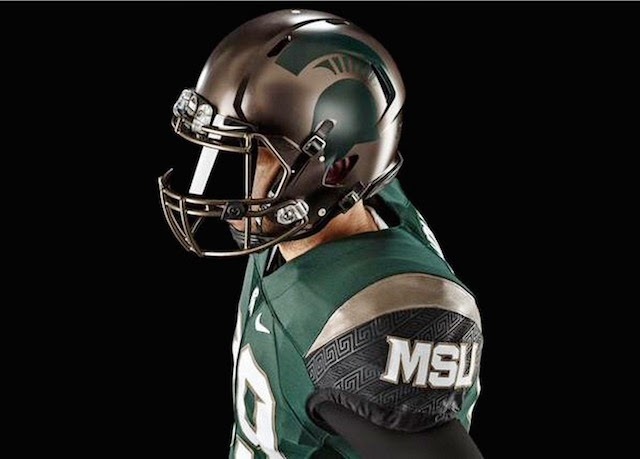 The 2015 uniforms include an alternate uni which, as explained by Nike PR director Heidi Burgett were "inspired by bronze Spartan shields & the phalanx battle formation." Old-guard Michigan State purists probably won't be too thrilled that the helmet looks similar to rival Michigan's "winged" helmet. The Fallout: Rose Bowl, UAB, Ohio State, and more. Nick Saban uses coachspeak in responding to Braxton Miller transfer rumors. Nick Saban had a few words to say Tuesday night about rumors about Ohio State quarterback Braxton Miller possibly transferring to Alabama. Needless to say, none of those did anything to conform or deny the rumor, first brought to light by ESPN media gadfly Paul Finebaum. 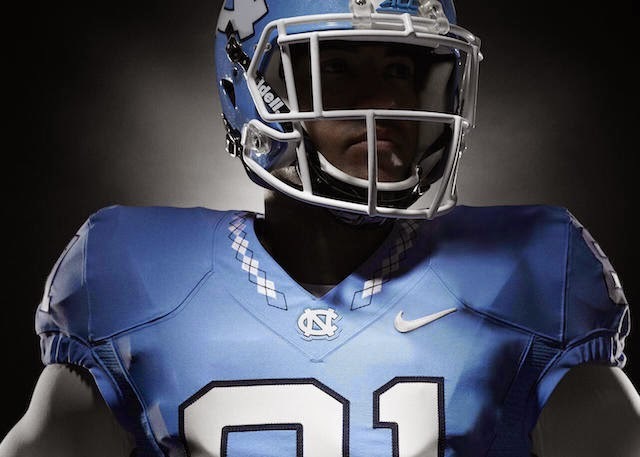 North Carolina 2015 football uniforms feature basketball team's argyle pattern. North Carolina's 2014 jersey. Photo via SI.com. Nike released photos of North Carolina's football uniforms for the 2015 season. The 2015 uniforms incorporate a design element familiar to men's basketball fans - the blue and white argyle pattern created by fashion designer and UNC alum Alexander Julian in 1991. Julian created the argyle pattern as part of a redesign of the Tar Heels' men's basketball team uniforms commissioned by the team's then-head coach Dean Smith in 1991. The designer said in a 2009 interview that he took inspiration from an argyle pattern that helped earn him his first Coty Award in 1977. He referred to the pattern his "lucky argyle," and added it to the men's unis. The argyle has been featured on every iteration of UNC's men's basketball team uniforms since 1991, including the three NCAA Men's Basketball Tournament titles in 1993, 2005, and 2009. The argyle appears around the collar of the football jerseys, on the sides of the pants, and on the stripe on the helmets. The new football uniforms are part of an across the board rebranding at North Carolina, which will standardize lettering, numbers, and logos for the school's 28 sports teams. 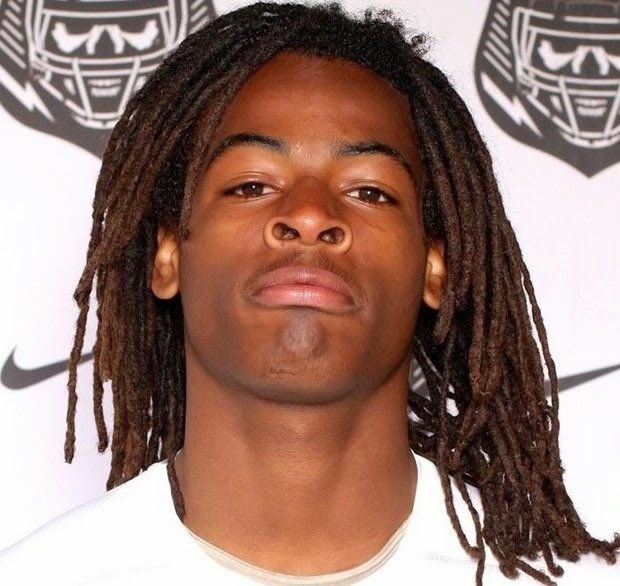 Junior running back Najee Harris is first commitment to Alabama's 2016 recruiting class. Najee Harris. Photo via 247Sports. National Signing Day 2016 is still 10 months away. Consider that for a moment as Alabama has managed to get its first commitment for its 2017 recruiting class. Florida redshirt defensive back J.C. Jackson arrested in connection with armed robbery. Another Florida player is in trouble with the law. Redshirt freshman defensive back J.C. Jackson was arrested by Gainesville, Fl. police on charges of being involved with the armed robbery of a person described as being "an acquaintance." 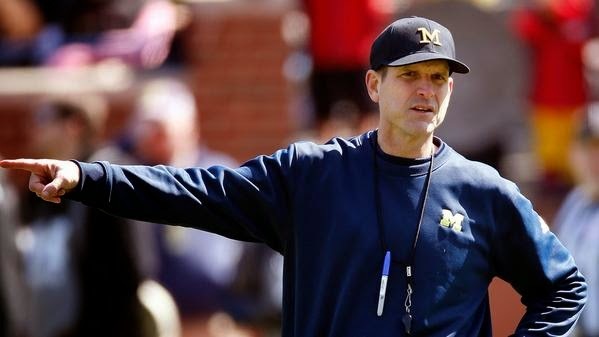 The Fallout: Jim Harbaugh, Bronco Mendenhall, Alabama, and more. Steve Spurrier turning 70, still working out harder than most sports reporters. Steve Spurrier posing shirtless with Josh Kendall. Photo via The State. It's almost hard to believe that Steve Spurrier is turning 70 on Monday. Part of that disbelief comes from the fact that the South Carolina head coach neither looks or acts his age. Spurrier credits that to a workout regimen that he's managed to maintain on a regular basis since his days as a quarterback in the NFL. The Fallout: Jameis Winston, John Swofford, spring games, and more. Vandals paint Michigan State Spartan statue maize and blue. From the "Things that have only gotten less and less funny over the years" department comes news that vandals have once again painted the Michigan State Spartan statue maize and blue. Things kind of came up today. Sorry for that. Be back tomorrow. Utah releases Fast and Furious homage-style recruiting video. Utah has released a video warning other schools to stay away from what it considers its recruiting territory. Apparently, Utes head coach Kyle Whittingham and his coaching staff plan to outrace opposing coaches to the Beehive State's recruits, Fast and Furious style. Lou Holtz is an ex-ESPN college football analyst. Lou Holtz is an ex-ESPN college football analyst. SI.com reported Sunday night that the 78-year old former coach and the had come to a "mutual agreement" with the network in regards to his departure. The Fallout: Mike Riley, Mark Richt, Utah State, and more. 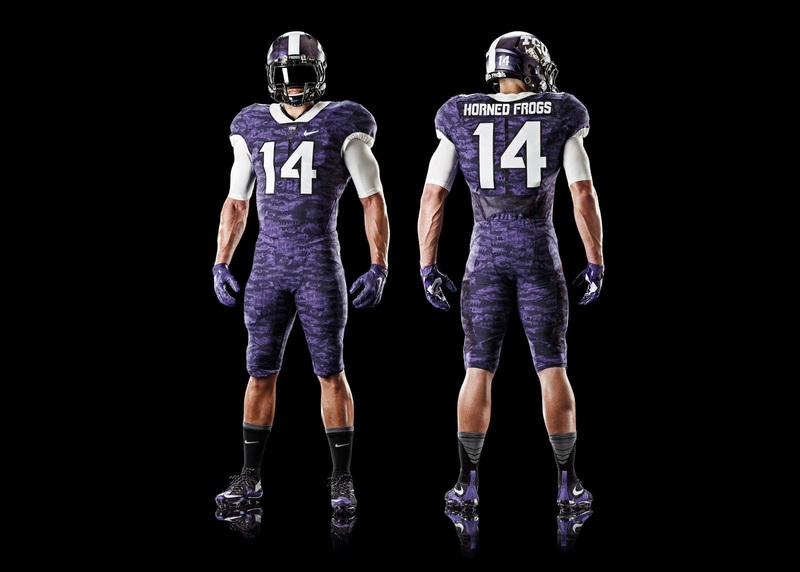 Nike reveals TCU's 2015 uniforms. Uncle Phil's Misguided Children strike again! This time Nike has released the 2015 season designs for TCU, which include patters inspired by the skin of the school's horned frog mascot. Off day be back tomorrow. Is Georgia Southern the next Boise State? Could Georgia Southern become the next Boise State? The one-time FCS powerhouse-turned fledgling FBS program took the Sun Conference by storm in its first season, going undefeated in conference play and winning the conference title. The Fallout: Morgantown, WV. cracks down on West Virginia supporters burning patio furniture. West Virginia fans being West Virginia fans. Photo via WV Public Broadcasting. The city of Morgantown, WV has had enough with West Virginia University students and their penchant for burning things following football and basketball games. The city council has taken the draconian measure of banning outdoor upholstered furniture within the city limits. Relaxing of NCAA rules could loosen regulations on conference title games. Deregulators, Mount up! CBS Sports' Dennis Dodd is reporting that the NCAA is expected to pass legislation that would deregulate how conference championship games are played. Army retires "Black Knights" nickname, rebrands as "Cadets." Army is retiring its "Black Knights" nickname. The academy will replace the nickname, used officially since 1999, with the more traditional "Cadets" nickname. 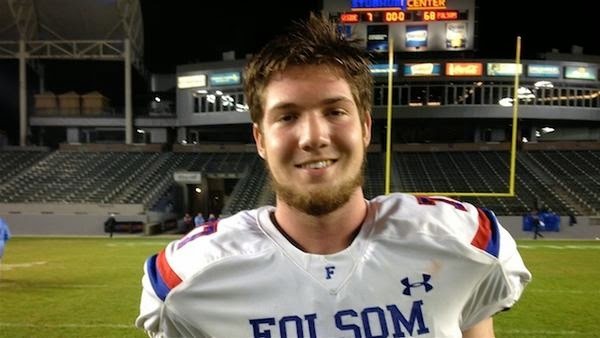 Alabama adds California OT Jonah Williams to 2016 recruiting class. Jonah Williams. Photo via scout.com. Alabama got its sixth commitment for its recruiting class of 2016 over the weekend. Folsom, Ca. offensive tackle Jonah Williams made his commitment to the Crimson Tide on Saturday. Labels: Alabama Crimson Tide, Jonah Williams. Easter with the (Blue) Devil: Christian Laettner signing autographs in Indianapolis. 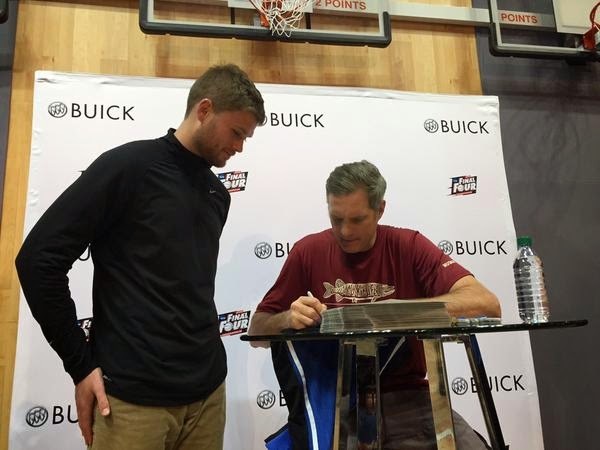 Fan with Christian Laettner at Final Four Fan Fest. Image via @laettnerball. The bad news for former Duke and NBA star Christian Laettner is that neither he or those of use in the unwashed masses will get to see a repeat of the 1992 Duke vs. Kentucky NCAA Men's Basket Ball Championship. The good news? Laettner is now second behind Wisconsin's Frank Kaminsky as the least popular basketball player in Kentucky basketball history (at least for now). Though when you think about it, that might be even worse news for Laettner, who does seem to like being the boogeyman in Wildcat nightmares. Jim Harbaugh gives some free Easter egg hunting advice on Twitter. Jim Harbaugh at Michigan's Spring Game. Photo via Scoopnest. Ready for that annual Easter Egg hunt at your family's annual Easter get-together? First-year Michigan head coach Jim Harbaugh has provided some handy advice for you via Twitter. The Fallout: Steve Spurrier, Christian Hackenberg, Urban Meyer, and more. Ohio State head coach Urban Meyer is named the top head coach outside the SEC by Saturday Down South. SDS should put an asterisk next to that one since Meyer was the former head coach of Florida. Florida State's Jimbo Fisher, Michigan State's Mark Dantonio, TCU's Gary Patterson, and Oregon's Mark Helfrich round out the list. The Fallout: Nick Saban, Ezekiel Elliott, Kirk Ferentz, and more. Jonathan Taylor won't be reinstated at Alabama despite accuser recanting domestic violence allegations. The accuser in the domestic violence case against Jonathan Taylor has recanted he accusations she made the former Alabama defensive tackle. She has since been arrested for giving a false report to the police. Despite this development, the both the school and head coach Nick Saban says Taylor will not be reinstated. Things kind of came up today. Will be back tomorrow.